We’re heading to Ireland, want to join us? Songs about, well, nevermind. Investing in downtown. Your plans for St. Paddy’s Day are here. Structuring construction. Producing FSE shows. The Project for Downtown. A first peek at St. Paddy’s Day. As downtown Las Vegas continues to grow into a cultural hub for the city, this episode of FSE LIVE! focuses on many of the people leading the charge. Say “FSE LIVE” get 15% Off!! Remember when we said we weren’t afraid of the cold. 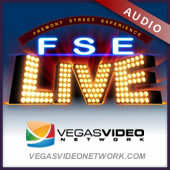 For this episode of FSE LIVE!, we shoot our first show inside a casino. Specifically, the historic Fremont Casino & Hotel, where a VERY YOUNG Wayne Newton got his start. Jeff begins the show by chatting with Jim Sullivan, VP/General Manager of the Fremont Casino & Hotel. We follow with David St. John and Kelly Christian (Yellow Brick Road), Sam Cherry (Cherry Development), and wrap up with the scoop on the Chinese New Year with Jan-Ie Low (Managing Director, Golden Catalyst). After reviewing the past five episodes of FSE LIVE, Jeff decided we had way too many men on the show. So, for this episode, we have our first all-female show, which was shot, appropriately enough, from the Four Queens Hotel & Casino. Joining us on tonight’s show are our four queens, Lisa Robinson (Four Queens), Heather Riggi (Venus Rising), Alexandra Epstein (El Cortez) and Megan Conklin (Fremont Street Experience).